Please follow these instructions to insure that your entry is processed properly. 2. Each entry must include two samples of each product submitted. If products require batteries or other accessories, they must be provided. 3. The appropriate number of completed entry forms. Please include one full set of entry forms and supporting materials (press releases, etc.) per sample. For example, if you are entering a product, you need to send two samples, plus two sets of entry forms, one for each product. All entrants will receive e-mail confirmation that their entry has been received. All Winners will be notified after entry deadline. Winners will receive digital Family Choice Award logos for use in their company’s marketing and promotional materials that extends through the lifetime of the product. 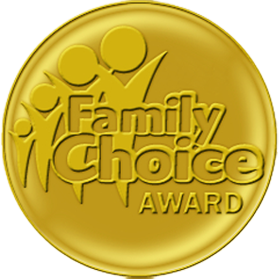 Winners will also receive a starter set of attachable Family Choice Award logos. Winners of Family Choice Awards will receive promotional coverage through national press releases, websites, e-blasts, coverage in cooperating publications and events throughout the year. This will serve as our recommendations to all consumers. Entries must be submitted by deadline. Products may be submitted for consideration in more than one category. Products that have been re-released with updated features will be considered new products. Items that are part of a series must be submitted and paid for individually. A series does not constitute a single entry. Please keep a copy of these directions and forms for your records. The name of the product as you would like it to appear. High Resolution Required. 300DPI Requested. Valid File Types: jpg, jpeg, png, gif, pdf, doc, docx, zip. manufacturer, publisher, etc.)? Please print carefully. Entries will not be accepted without the total payment in US funds. Please include the payment with the entry. When payment must come under separate cover, it is the entrant’s responsibility to make sure that it adequately refers to the product(s) entered. Licensing fee is included for winning products. Please note: to reflect any entry/product information changes in the media coverage, contact us in writing by the deadline date. Changes received after this date cannot be guaranteed to be reflected. USD To pay via PayPal, please enter amount to send. Fax: (818) 881-3264, Attn: FCA Dept.